The yield curve measures the difference between short- and long-term interest rates. Long-term rates are usually higher than short-term rates. That’s because there’s more risk in the long term. When short-term rates exceed long-term rates, the yield curve inverts. That’s a rare and ominous signal that has been an early warning sign for every recession in the past 60 years. The chart below shows long-term interest rates issued by the U.S., Germany and Japan. It shows why the yield curve is set to invert. Germany is paying only 0.24%. Japan offers investors just 0.03%. Meanwhile, the U.S. offers 2.87%. Global investors chase the highest yield. So, they’re buying U.S. bonds. When foreign investors buy bonds, they drive long-term interest rates down. This sets up the potential inversion that’s worrying so many analysts. But this time, the yield curve isn’t signaling a recession. That’s because of the unique circumstance of yields around the world being so low. Normally, the inversion would result from investors selling stocks as the economy weakens. Large investors need to put their money somewhere, so they buy bonds. That pushes interest rates down, and the yield curve eventually inverts. At least that’s what happened in the past. Right now, earnings growth is strong, and stocks are doing well. 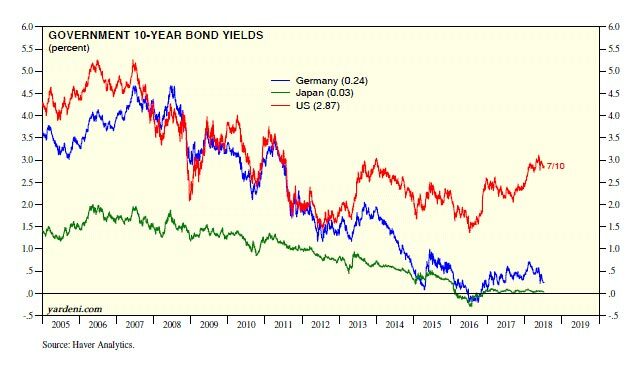 The yield curve is rising because global investors are also chasing yields and seeking safety in long-term bonds. This time, if the yield curve inverts, it will be a short-term time of strength for U.S. stocks and the dollar. It won’t be a reason to worry, at least not at first. This will be a signal to buy since stocks are likely to shoot higher as dollars rush into the U.S. from around the world.